Hillsdale College offensive tackle Jared Veldheer has attracted the attention of multiple NFL teams, including the Oakland Raiders, whose owner and general manager, Al Davis, told him he hopes to draft him.In a nine-day stretch this month, Jared Veldheer spent more hours than he could remember in the air or just waiting around for flights in airports while making personal trips to six NFL franchises. Such is the life of a fast-rising draft prospect. 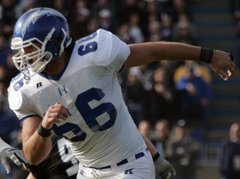 Veldheer, a 6-foot-8, 312-pound offensive tackle from Hillsdale College, is targeted as a third-round pick in the 2010 NFL draft, although he could go higher based on all of the pre-draft interest that surrounds him. The former Forest Hills Northern standout participated in the Texas vs. the Nation all-star game, attended the NFL scouting combine in Indianapolis, had eight teams put him through individual workouts on his college campus and been summoned to Arizona, Denver, New York, Oakland, Philadelphia and San Francisco for in-depth discussions about his future — all in the past two and a half months.